This article originally appeared on Zester Daily and MSN Food & Drink. If you ask me, perfection is overrated. I give it an 8.2. You can obsess and compulse until you’re just the right shade of blue in the face, but to create an artful eyeful that requires little primping, preening or pruning? That’s a 10. 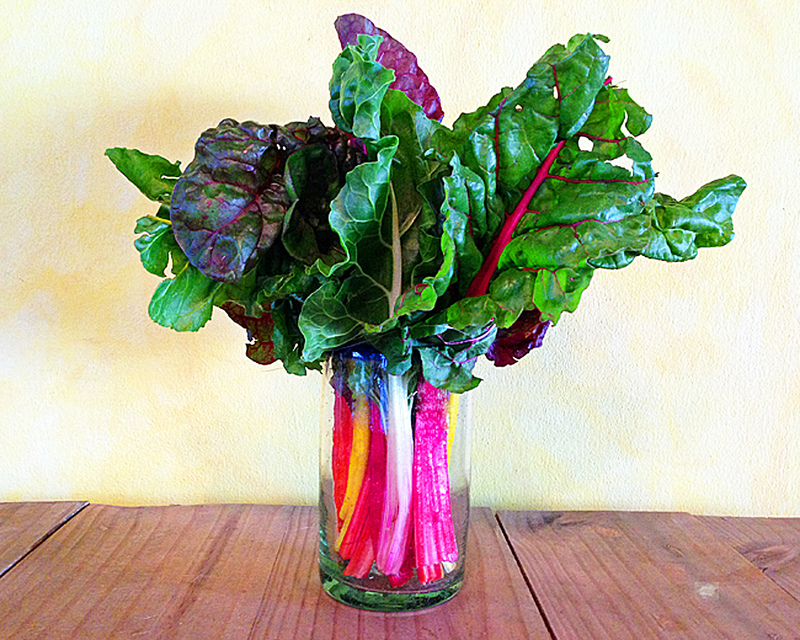 Farm-to-table centerpieces that you can eat the next day are creatively fulfilling and less landfilling. Seasonal root vegetables, fruits, herbs, pumpkins and squashes will do all the heavy lifting for you. Well, most of it, anyway. You need at least one good eye. But don’t let it stray into OCD territory. Think fashionista farmer, not perfectionista mogul. Remember, Martha’s not invited. Believe it or not, Martha’s not the originator of ornamental fuss. Holiday centerpieces go way back before the decline of carbon civilization. The Romans used decorative leaves, branches and foliage in elaborately designed containers often made of ceramics and rock crystal. Aristocratic tables in the Middle Ages were said to be so crammed with food, there wasn’t room for centerpieces, although at Christmas, centerpieces may have included pastry and marzipan shaped like people, animals, scenes or decorative objects. 17th-century tables featured silver or gold platters that showed off the host’s wealth and status with whole animal heads or a cooked peacock with its colorful feathers adorning the platter. While the 18thcentury introduced silk and porcelain flowers, the 19thcentury donned fresh flowers, foliage, fruit, candelabras and molded puddings and jellies. Throughout both centuries, centerpieces were often vertically constructed using pyramids of food on tiered dishes called epergnes. By World War l, decorative objects began to replace flowers and foliage, but during the 1960s and 70s, flowers and grasses made a comeback. 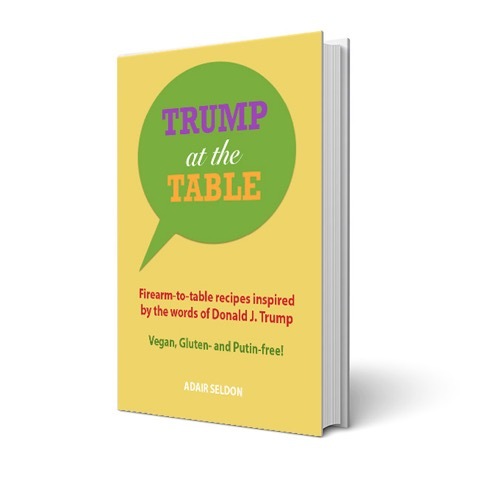 Today, in the era of climate change and environmental consciousness, I proclaim it the age of the sustainable table with the eco-chic, farm-to-table centerpiece. 2. 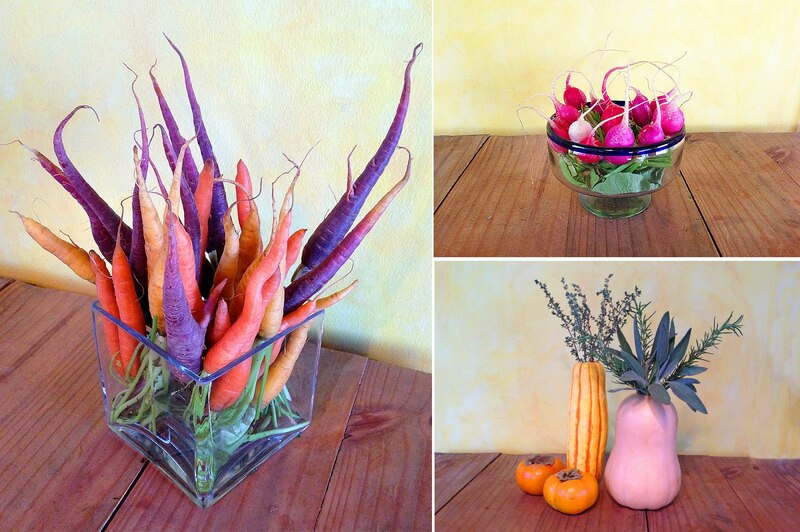 Celebrate the season with local, seasonal produce. Don’t even think about buying fruit from Chile! 3. Don’t make the arrangements so tall that you can’t see your guests (except for the uninvited ones, so keep some long fennel or chard in the fridge, just in case). 4. You can line up multiple small (and short) arrangements along the center of the table. Who says a large, dominant one is always the best choice? I think Maria Shriver would agree. 5. Use glasses, jars, vases and vessels you have around. They don’t have to match. 6. Don’t spend money on crap you don’t need (or won’t eat)! Remember those landfills! 7. If you’re going to add store-bought flowers, buy them at the farmers’ market and make sure they were grown without pesticides. 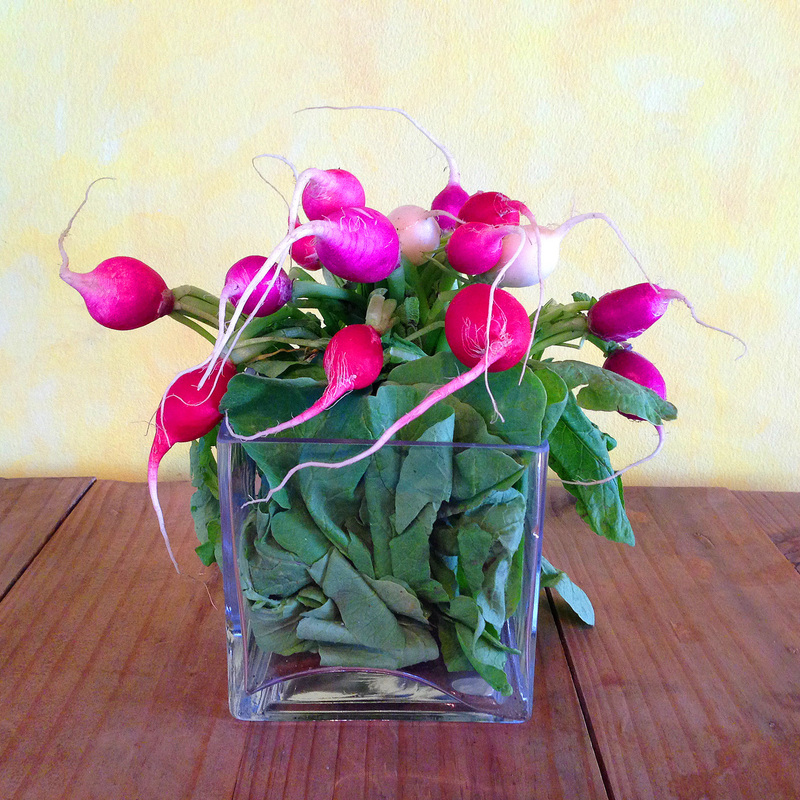 Cut flowers full of pesticides at the table may spur someone’s allergy. Just sayin’. 8. Don’t do doilies. You might as well wear an Elizabethan collar. Trust me. Neither are the eco-chic look you’re going for. 9. No stacked cookies with twine around them. Can you lay off the Pinterest for one lousy day? 10.If someone admires an arrangement, be generous and gift it. Less pressure to use up all those rutabagas (see tip #1). 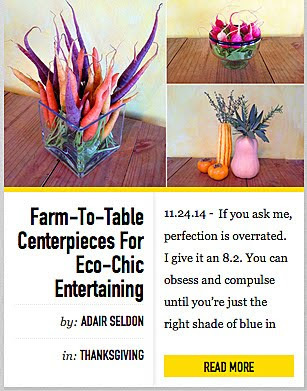 When you create your own farm-to-table centerpiece, you’ll be an eco-chic badass. And that’s a good thing. See all 10 centerpieces here. Kale Wars? Dumpster Diving? Must-See Food TV!